If you are sick, suffering from lack, broken, split apart from your loved ones, and controlled by negative character bents, then you could have a wound in your soul that goes all the way back to Genesis 6. 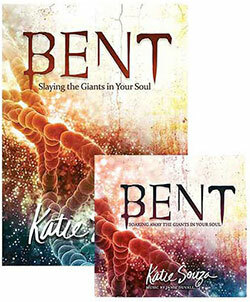 If so you are fighting against spiritual giants and Katie teaches you how to be free from their control! Ever wonder why you just can’t seem to gain victory in some areas of your life? You might have a negative character bent! Katie teaches you how to recognize those bents and what to do to get rid of them. Katie takes you step by step through Scriptures and decrees that will help you get the breakthrough you have been seeking. This anointed soak features the music of Janie DuVall. As you meditate and rest in the atmosphere of the Word of God, it will release the power to save your soul (James 1: 21). Step by step you will be healed and delivered of everything you have in common with the giants. Then, you will walk in divine health, peace of soul, unity in your relationships, and prosperity in every area of your life. Katie Souza writes, teaches, and travels extensively. She is the founder of the prison outreach Expected End Ministries as well as Katie Souza Ministries and is the author of The Key to Your Expected End (The Captivity Series) and Soul Decrees. She produces a live television show, Healing Your Soul: Real Keys to the Miraculous, which airs on international networks such as Daystar Television Network, Faith USA, and Family Entertainment Television. Katie lives in Maricopa, Arizona, with her husband, Robert, and their two small dogs.